The Mining 2018 guide provides expert legal commentary on key issues for businesses. The guide covers the important developments in the most significant jurisdictions. Ricaurte Rueda Abogados specialises in administrative law, with emphasis on mining, oil and environmental law. Lawyers offer expertise in mining titling, and administrative representation before the Mining Authority, National Mining Agency (ANM) and the Government of Antioquia. Additional expertise includes environmental matters for the mining industry and administrative representation before the different Environmental Authorities: Ministry of Environment and Sustainable Development (MADS), Regional Autonomous Corporations (CAR) and Departments of the Environment (DAMA). 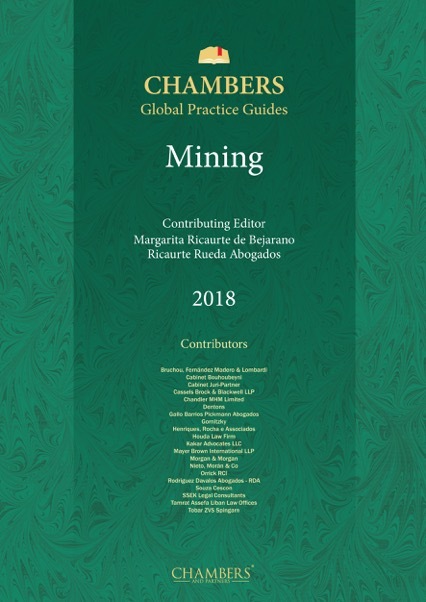 Judicial representation in popular and group actions related to mining and environmental activities, as well as nullity and restoration of rights, and contractual actions. Lawyers are also experienced in mining contracting, easements, operation contracts, integration of areas, assignment of rights, assignment of areas and other matters related to mining. The firm offers training in mining, oil and environmental law for companies and institutions through specialised courses and seminars. Given that Colombia is a country with a mining tradition that dates back to Pre-Columbian times, the mining industry in Colombia has been of the utmost importance through history. Although in recent years the international coal prices have not been high, this mineral is the one most produced in Colombia, and it is the second largest export after oil, placing the country as one of the world’s major coal exporters. According to the Colombian Mining Information System, in 2015, 85.5 million tons of coal were produced, and ferronickel obtained the second place, reaching 36,670 tons in 2015. The mining industry is a key sector for Colombia’s economy (in 2014 it contributed 2.1% of the Gross Domestic Product). Over the past few years it has had a steady growth (according to the Ministry of Mines and Energy between 2010 and 2014, mining had a growth rate higher than other productive sectors such as forestry, fish-farming, and in certain years, manufacturing). The favourable prices that minerals had between 2010 and 2012, and the creation of a national government policy that promotes mining and foreign investment, explain such growth. Notwithstanding the above, the decline of mineral prices and the significant legal uncertainty, the latter, geared by the Constitutional Court's decisions that have changed the rules in the industry to privilege the regions and communities, and that tend to over-protect the environment, have affected the Colombian mining industry. The industry has also been affected by gaining an unfavourable reputation in the community and by the State’s lack of co-ordination between environmental and mining authorities, long delays in mining procedures, social conflicts in regions, obstacles in the prior consultation processes with communities, and by its ineffective fight against illegal and criminal mining. Despite the multiple challenges mentioned above, mining development is still a priority for the Colombian government, given that as set forth in the National Development Plan 2014-2018, the mining and energy sectors are considered key promoters in the country's development. To such end, the Colombian mining authorities are planning the creation of a National Mining Policy to counteract the current issues that this industry is facing. Furthermore, Colombia is still very attractive from a geological perspective, as can be evidenced in the large-scale mining projects that will begin operating soon such as Buritica from Continental Gold that is estimated to extract 250,000 ounces of gold per year, or San Ramon’s project from Red Eagle that is expected to extract 50,000 ounces of gold each year. In addition to these, Sociedad Minera de Santander (Mubadala) in the Department of Santander is planning a large-scale project that stands out and shows that investor interest in Colombia remains active.